To pitch means ‘to set up a tent or a camp’ or ‘to be at an incline or cause to be at an incline.’ It also means ‘to throw something,’ especially the ball in baseball. Figuratively, it means ‘to aim for something’ and is mostly used in the expression pitch your hopes. Pitch also means ‘to fall.’ As a noun, pitch is the degree of intensity of something and, in music, it refers to how high or deep sounds are. Pitch is also a thick black substance used for paving roads. Mark pitched the ball with all his strength. The roof pitches at a sharp angle. The campers pitched their tent next to the stream. I know you want to be a rock star, but I think you might be pitching your hopes too high. As the ship rolled, Wendy pitched forward. The children's excitement reached its highest pitch when they got up on Christmas morning and saw the presents under the tree. The musician concentrated on getting the pitch right. The construction worker used pitch to fill the potholes in the road. 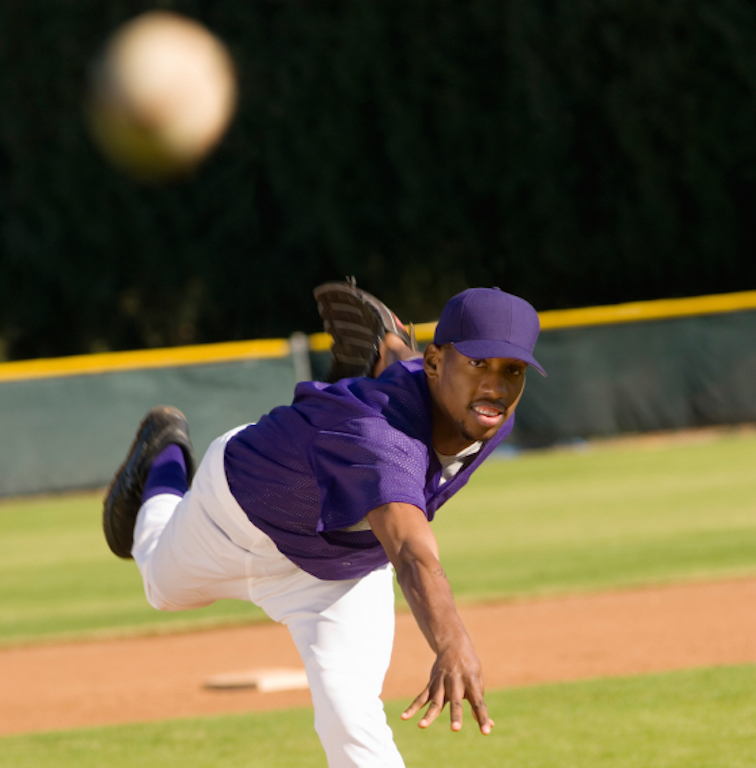 In UK English, a pitch is also an area of ground that has been marked out for playing a sport, like soccer or rugby. Pitch dates back to the late 12th century, in the form of the Middle English verb picchen or pycchen, which originally meant ‘to thrust in, fasten or settle.’ Some linguists believe that it may have split from another Middle English verb, picken or pikken (to prick or pierce), from the Old English verb pician (to pick or prick), while others think it may have split earlier, forming an Old English verb (for which we have no records) that could have been piccean. Either way, it can be traced back to the West Germanic prikojan, possibly from the Proto-Indo-European root bew– or bu– (to make a dull, hollow sound). Pitch is related to the Low German pricken and the Dutch prikken (meaning ‘to prick or pick’), the German picken (to pick or peck), the Old Norse pikka or pjakka and the Icelandic pikka (to prick or pick), and the Swedish picka (to peck), as well as the English words prick, pick and peck. The sense ‘to set upright’ (as in a tent) dates back to the late 13th century, and expanded from the notion of driving in the pegs to fasten it. In the 14th century, the sense also expanded to ‘hit the mark,’ which evolved, by the late 14th century, to the meaning ‘to throw something’ (usually a ball). The sense ‘to lean forward and downward’ dates back to the early 16th century, and ‘to roll in waves’ is from the early 17th century. The verbal phrase ‘pitch in’ appeared in the mid-19th century. The noun, meaning ‘something that is pitched,’ dates back to the early 16th century, and comes from the verb. The sense ‘slope or inclination’ appeared in the mid-16th century, and the musical sense in the early 17th century. The sense ‘plunging headfirst’ is from the 18th century, and ‘the act of throwing’ was first used in the early 19th century. Pitch, meaning ‘wood tar’ or ‘a resinous substance’ also dates back to the late 12th century, as the Middle English noun pich, from the Old English pic (pitch). It can be traced back to a Germanic borrowing of the Latin pix, from the Proto-Indo-European root pik– (pitch). Pitch, in this sense, is related to the Old Saxon and Old Frisian pik, the Middle Dutch pik, the Dutch pek, the Old High German pek, the German Pech and the Old Norse bik (all meaning ‘pitch’), as well as the Greek pissa, the Lithuanian pikis and the Old Church Slavonic piklu (also all meaning ‘pitch’), and the Russian peklo (scorching heat or hell). The verb, meaning ‘to cover with pitch’ also dates back to the 12th century, and comes from the same source as the noun. The phrase pitch black first appeared in the late 16th century, and pitch dark a bit later, in the late 17th century.